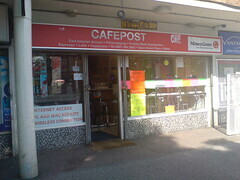 Internet cafe and sandwich bar on Abbey Street in Bermondsey. It is based in the former Abbey Street post office which closed in 2005. Some of the post office fittings are still in place photo. They only sell sandwiches, hot and cold drinks and crisps and chocolate. There are three tables joined together in the middle of the space with chairs around which are for people eating in. secretlondon visited one lunchtime in September 2008. I had a toasted cheese and ham baguette (£2.50) photo and a latte (£1.70) photo. There were about 12 PCs which were £1/hour to book. A sign on the window mentioned wifi, and SE1 also mentions wifi. I asked and it is £2 per hour. Accessibility: There is no step to get in, and no obvious toilet. Last edited 2008-12-09 23:47:10 (version 9; diff). List all versions. Page last edited 2008-12-09 23:47:10 (version 9).